Yesterday we reported the case of the Ripley County, Missouri hoarding situation. We stand corrected on the numbers. 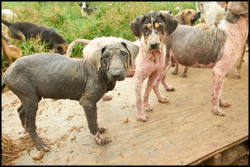 103 dogs and 6 cats were rescued by the Humane Society of Missouri Animal Cruelty Task Force. Watch as Mike Perkins, Assistant Director of that Task Force explains what they saw and what comes next for these rescued animals. with what love and trust the people with dogs all over the meters behave! whether they have ALREADY JUST Nicer LIFE!